Deadwood: "A Two-Headed Beast"/"A Rich Find"
"A Two-Headed Beast"/"A Rich Find" / "A Two-Headed Beast"/"A Rich Find"
"A Two-Headed Beast"/"A Rich Find"
Deadwood doesn’t really do iconic. It has a number of great setpieces, but it’s as much known for its subversion of traditional Western tropes and expectations as anything else. Which is why one of the biggest subversions of tropes becoming the one iconic moment from the series is, in its own way, sort of odd. 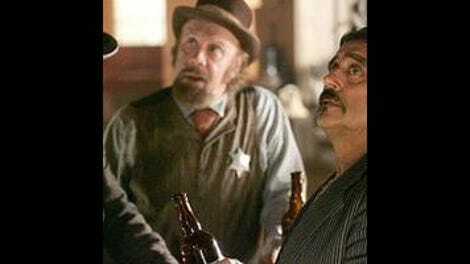 The one scene most casual viewers of Deadwood – who checked it out because they liked it but didn’t really get into it the way some of us did – can recall with complete clarity now is usually the fight between Dan Dority and Captain Turner, a brutal, ugly thing that gets at the truth of what it’s like to be in a street fight, even as it turns into something so gritty that it transcends that grittiness. It’s a terrific sequence, don’t get me wrong. There’s a reason I chose it to lead off this write-up. 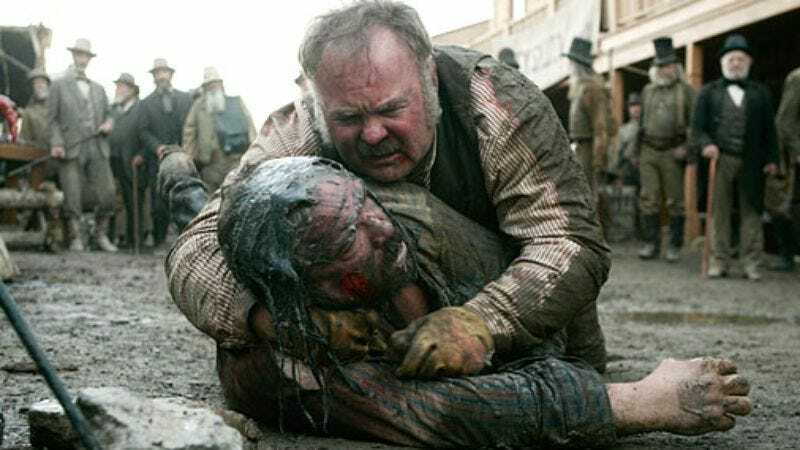 Unlike some of its HBO brethren, Deadwood rarely spent a whole episode brooding on the cost of violence on the human soul. That theme was present frequently, but it was not often the focus. There was just so much the series wanted to take in that it usually skated past this with a nod to it. “A Two-Headed Beast,” the last episode credited to series creator David Milch (though Milch’s writing process ensured his fingerprints were all over every script), steps that theme up to the forefront for the first time since early season one, and it does a bang-up job with it, as well as providing W. Earl Brown some terrific stuff to play. In a way, some of these early season three episodes feel like Milch refocusing the show on some of the things it was about in early season one, as if he wanted to get back to the show he initially created that then mutated into the show that it did. Deadwood had not really been a revisionist Western since those early days, possibly since Wild Bill Hickock was killed. Sure, it was set in the West, but it didn’t really play off of most of the tropes of such a setting, even though all of the characters were in place. This, obviously, is not a bad thing, since revisionism for revisionism’s sake can sometimes get awfully tiring. Had Bullock always remained the character that showed the sometimes rage-filled underpinnings of the quest for justice, he might have grown quickly boring. Instead, Milch gave him a wife he barely knew and an unfulfilled love for Alma and a whole host of new concerns and issues, and that made him an immeasurably more interesting character. But the fight between Dan and Captain Turner is nothing less than a revisionist take on the old-fashioned Wild West standoff, something Deadwood had already done a revisionist take on in early season one. Granted, neither Dan nor Captain Turner brings a gun to the fight, and neither takes a position at either end of the thoroughfare after counting off ten paces, but the scene starts off with that feeling all the same. The two square off across the street, and after a wagon passes between them (a nice directorial touch from Dan Minahan), they rush into each other’s arms, grappling to see which can drag the other down into the mud first. From there, the fight seems to last an agonizing amount of time, with both dishing out a fair amount of damage on the other, but with Dan getting the brunt of it, having his head bashed against a rock, his face buried in a mud puddle and his body battered all over. (And his escape from the mud puddle still seems a little too convenient to me on a rewatch.) The choreography of the fight, such as it is, is almost completely dedicated to making the fight look as brutal and uncoordinated as possible. Dan comes out on top, as he must, but the way he does so is so blunt in its declaration of what it takes to win a street fight like this – he gouges out Turner’s eye! – that it provides the last note of over-the-topness that the scene needs to really sell itself. But the whole thing is a beaut, one of the best fight scenes I’ve ever seen on TV, from the way the two seem like they’ll just land insignificant punches for the bulk of the fight to the way a horse dances around the two to the way Dan only takes out Turner after Al gives him a subtle nod (and then Al disappears into the Gem). It’s almost as if the show is reminding you that it could do this kind of thing in its sleep if it really wanted to. But both the build-up and comedown from the fight are terrifically done as well and neatly intertwine with the episode’s other two big stories – Alma’s back on the dope and Bullock is still trying to negotiate the transfer of the livery from Hostetler to Steve – on a thematic level. The central idea of the episode, put a bit too bluntly, I’m afraid, is who’s got your back? As things start to get really bad in Deadwood, the townspeople are starting to choose sides, and, as always, Milch finds the most comfort in the idea of community. As antisocial as Dan can be, he’s come to represent this idea of the organic community rising up to protect its interests, while Turner and Hearst represent the outside interests pushing their own ideas onto the community at large. We spend more time with Dan than with Turner in the build-up to the fight, but it seems as though Dan has the backing of his friends and associates (particularly Johnny), while Turner pretty much just has Hearst. It’s a fairly classic underdog vs. big man setup, but Deadwood wrings a sort of pathos out of it in that scene where Dan tells Johnny exactly how the fight is going to go down and in the scene after when Dan sits alone in his room, naked and trying to recuperate from what just went down, unwilling to see anyone, even Cochran. Alma’s addiction is the more troubling thrust here, ultimately. She’s clearly losing herself to her return to drugs, and her addiction endangers everyone in the camp, since she’s essentially their financial backing en totale. As much as this situation troubles Trixie, though, it troubles Ellsworth even more, who reacts poorly to her coming on to him after he’s had a bath, able to detect that she’s completely high. Ellsworth’s seemingly impossible nobility is something you sometimes just have to go with, but here, he sure seems in the right. High Alma is rather creepy, all things considered, and the look of anguish on his face as he starts to realize that some of the things he hoped might happen are happening but in a way where he’d much rather they weren’t happening is one of my favorite moments for Jim Beaver. His insistence that Sofia needs to come first adds to the tragedy of the scene. And, of course, Hearst, Ellsworth’s ultimate nightmare, is in town, so Alma’s addiction’s return is doubly disturbing for him. Ellsworth is the one character who is unfailingly loyal, but his ultimate loyalty is to the well-being of the camp, and he sees all of the dangers present here. Hostetler, another character who tends to be unfalteringly decent, is an interesting contrast to Ellsworth. Ellsworth’s torments are more private, while Hostetler has to deal with the angry and hateful Steve, who spends most of the episode subtly berating the old man and then finally just breaks from doing that to angrily accost him after he finally receives the board that had his note about screwing the horse on it, only to see it has no writing on it anymore after having been hid beneath the straw for so long. Steve’s deep-seated paranoia erupts at this, and he’s soon berating Hostetler as a liar, suggesting that the true board may arrive from elsewhere and he’ll be impugned as a guy who screws horses, probably a bad thing for someone who owns a livery. Hostetler takes such offense at this that he shoots himself, something that has always struck me as a bit undeveloped, but Steve’s anger and lashing out is so over-the-top that it makes sense in a perverse way as well. Driven by his powerlessness to stop this situation, then, Bullock heads into the Bella Union to arrest Hearst for the death of a Cornish union agitator (a warning sign sent to the workers, just as Dan was to be a warning sign sent to the town at large), which pushes things too far for Al’s taste. Then there’s the tiny subplot about the theatre company, who welcomes the dying member Chesterton to town. Since this is so disconnected from the action, it continues to feel a bit superfluous, but this storyline proves ultimately moving, and this is a worthy introduction to it. If nothing else, this revisit of the series has convinced me that I would watch a show about the theatre troupe by themselves. I’m just not sure that grafting that show onto Deadwood as it exists at present was the best idea in the world. At the same time, E.B., who was feeling disconnected from the show in the last couple of episodes, gets a reintroduction into the main center of the show as Al tries to get information out of him. E.B.’s realization that everyone in the Gem doesn’t trust him any longer is simultaneously really funny and also sad. Here’s a guy who was one of Al’s chief lackeys in season one, and now he barely merits a mention. All in all, “Beast” reinforces the sense that the community of Deadwood is a community. Even as the fight designed to cow them into obedience to Hearst is fought between two men and two men only, people in all areas of the camp are banding together to do what they can to protect both their livelihood and the lives of their fellow citizens. Even as the episode raises the temperature of the town’s situation to the boiling point, there’s a sense that cooler heads – from Al to Ellsworth to even E.B. – are trying to prevail and prevent ultimate and utter destruction. And after raising that temperature substantially, Deadwood tries to dial it back just a bit by stretching one long day when the residents of the camp, worried about what Hearst might do in way of retaliation for the humiliations he’s suffered, spend the entire day trying to figure out a way to protect themselves against whatever he might do. It’s a necessary pause, and the second episode of this two-parter, “Unauthorized Cinnamon,” which I’ll cover next week, is one of my favorite episodes of the series, but at the same time, it can seem like a sudden halt to the momentum that was very carefully building in the first five. If that halt seems too abrupt, Deadwood is just hoping you’ll trust that it knows where it’s going and be OK with that. To that end, “A Rich Find” is again about the community coming together as one, as all interested parties quietly marshal their strength and unexpected players perform unexpectedly selfless acts. It brings in a bunch of characters who were absent in “Beast,” including Jane and Joanie, among others. It’s a breather of an episode, and it is just a bit too much of the calm before the storm, but it’s full of vivid and well-done scenes, and the season would be all the poorer if it didn’t have this short break in the tension. The basic gist of “A Rich Find” is that Hearst wakes up in Bullock’s jail cell the morning after his arrest, only to have Charlie Utter show him the corpse of the Cornishman who was found dead in the street by Blazinov and Merrick the day before. This, as expected, further agitates Hearst, and the town’s citizens immediately begin wondering and worrying about how he’s going to retaliate (well, those who have any connection to Hearst, that is). Al and Bullock begin their plans for what they’ll do if Hearst brings an army down upon the town, while Hearst stews about the indignities foisted upon him by a “maniac” sheriff and a town that he is rapidly coming to hate far more than feel any affection whatsoever for. My favorite scene in this episode may be a very quiet one between Blazinov and Merrick. The two, meeting up some time after Hearst gave Blazinov a telegraph to send, discuss the deaths of Blazinov’s parents long ago and in Russia, when he was away at school. As the scene goes on, it becomes apparent that Blazinov is both talking about that and talking about the telegraph he just sent out, subtly confirming what Al and Charlie suspected was the case by letting us know that, yes, Hearst is going to bring men to the camp to utterly raze it. "We are swept up, are we not, by the large events and forces of our times?" Merrick says, and it becomes something of a meditation on the show’s relationship to actual history. The reason that Hearst cannot die is simply because we know that he did not die in real life, even though the fictional Hearst portrayed here is reportedly very different from the Hearst who actually existed. Just as Merrick and Blazinov cannot escape the history that surrounds them, the show cannot escape the history that is its setting. It cannot radically reinvent what is to come. Alma’s addiction again takes precedent here. Now that Cy has told Hearst about it (something Hearst wishes he had known about earlier), the tyrant thinks he can potentially create a situation where Alma dies and it seems accidental. At the same time, Leon briefly refuses to peddle drugs to Alma, putting the well-being of the camp ahead of the well-being of his employer for a short while, before his employer reminds him with a snarl of his purpose in the camp and on the Earth. All of this is presaged by a strange, moving monologue where Leon stares into a puddle while high and questions his actions, the sort of lovely little grace note Deadwood offers in spades, where it seems to be suggesting a rich, inner life to a character who has only existed on the sidelines until this moment. At the same time, Trixie is getting fired from the bank for daring to suggest that Alma’s current course is too reckless, and Alma’s care of Sofia is not working either. She actually hurts the girl while brushing her hair to ready her for school. Alma’s return to the dope came on a bit too suddenly for me on this rewatch (it’s spurred by Hearst, yes, but I’d think she would show slightly more spine before crumbling, though, again, Hearst doesn’t play by the rules anyone in Deadwood abides by), but I do like the sense it is sending through the camp that their current course is fraught with peril and could fall apart at any moment. That it knits together characters like Leon and Trixie, whom I doubt have ever shared a scene together before this, is further proof that the show still has ways to surprise us at this late date. Aunt Lou is the focus of another of the episode’s plots, as her son Odell arrives from Liberia. He brings claims of a rich gold find and is going to meet with Hearst about it. I confess to not completely caring about the Odell plot, which takes on the usual theatre troupe position of being one damn thing too much in this episode, but I do like the way that the show contrasts Odell, who is the first unapologetically proud black character on the show, with his mother and the NG, both of whom put on one face in front of white people (except for Jane) and another face in front of each other. The strained but loving relationship between Lou and Odell is compelling, yes, especially in that scene where she tries to protect him from dining with Hearst, since she fears for his life, but it becomes very hard to care about new characters on this show, when there are so many already existent and so many of them are already threatened by an ever-present danger. Still, it’s a bit difficult to write about “A Rich Find” without its companion episode, “Unauthorized Cinnamon.” In some ways, the two episodes form a thematic diptych, this one suggesting a growing sense of unease and dread and “Cinnamon” suggesting a sense of acceptance that what’s to come is what will come. Both episodes are essentially about moving pieces around on a chessboard, but “Cinnamon” feels like less of a stall because the thematic throughline there – what do people do when they are faced with their deaths – is stronger than the throughline here – how would you react if all of your worst fears were about to come true. As the episode ends, Al and Bullock are headed out to marshal the town’s few remaining strengths to a meeting at the Gem, while Joanie is inviting Jane in for a night of not sleeping on the streets. Both are attempts to find solace in the face of overwhelming odds, as Bullock and Al attempt to defeat the forces being marshaled against them and Joanie just tries to find a way to be back her depression and loneliness, but both are also suggestions that there are things that can only be overcome when we work together, not when we pursue our own, selfish ends, as a certain man ensconced in the Grand Central Hotel might. We’ll be going back to three episodes per week to finish this out before the fall season begins. If we run until the 16th, we’ll get buried in the avalanche of new show debuts. So expect the next two pieces to be fairly long. I love every scene of Hearst stepping out of his hotel hole onto his ad hoc balcony. There’s something so jarring about seeing it happen. Con Stapleton is the world’s most sensitive lover. I like the oblique references to the horrible banking crashes of the late 1800s in Alma’s interview with Merrick. I also like how thoroughly Merrick has accepted that he is pretty much just everyone’s mouthpiece. It is worth saying that E.B. is very, very funny in these two episodes, particularly in his casually eloquent racism. The fact that Chesterton looks so much like Benjamin Franklin always hangs me up for a few moments. I am weak. I do like the scene where the theatre troupe enacts the age old ritual of forming committees to prepare for the imminent opening of their theatre. Trixie monologuing about Alma’s addiction to Sol is full of some really choice lines, one of which I’ll quote below. Hearst’s apparently genuine sadness over the death of Turner is one of the things I like best about how the show chooses to portray him. He’s not actually a monster. He’s someone who chooses to be a monster because it suits him. Steve’s attempts to rewrite the story of how Hostetler died are so pitiful that it’s hard to work up a good hate for the guy. He’s just … stupid. And hateful. He’s more the kind of guy you shake your head at than actively fear. Though I do like the running joke of the proud, powerful Odell constantly running into Steve and Steve’s reactions to this. There’s been some concern in comments in the past couple of weeks that these write-ups are focusing too much on Al. That’s absolutely the case, probably from wanting to skew more toward newer viewers of the show, who may just want to understand what the hell Al’s scheming is up to. I’ve mostly left that stuff out of this write-up, but if Al’s actions in these episodes confused any of you new viewers, just know that he’s trying to stay one step ahead of Hearst and finding himself thwarted at every turn by others in the camp. Charlie Utter, again, is the person who both knows the cost of confronting tyranny with decency and the person who feels it must be done. An interesting and consistent character trait. I like the vaguely apocalyptic feel this season takes on as it progresses. It’s a new tone for the show. And let’s do some quotes, shall we?